We left home on August 10th, first to drop stuff off at storage and then to do a weeklong shakedown nearby while we worked out the kinks. We stayed at a Seven Feathers Casino RV park in Canyonville, OR, not too far from home. Turns out that was a good idea because in that first week we identified a TON of stuff we really didn’t need. So it was back to storage to drop off more stuff before we headed out for real. 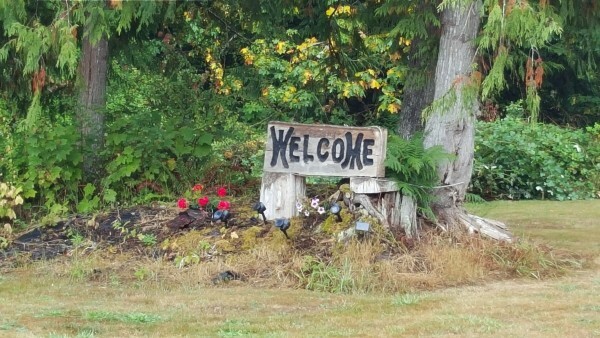 Our first planned destination was Port Angeles, Washington, to visit Jere’s sister and brother-in-law. We made our way up the Oregon coast and then inland around the east side of the Olympic National Park, staying at rest areas and then an Indian Casino in southern Washington. Near Port Angeles, we spent a week at the Elwah RV Park, which was very crowded, but nicely hippie-ish and reasonably comfortable. It was great to visit with Corrie and Thom. They were just finishing up building their house, so we got to see it in progress. They’ve now moved in and say there is a place for us to park the bus when we come to visit the next time. After Port Angeles, we headed down to Coachmasters in Bend, Oregon to get some minor repairs done on the bus. The trip down was uneventful. We stayed overnight in several different rest stops. They are generally nice, level and not too noisy (unless you get right next to a truck with a generator running for a fridge unit). Oh, and they are free … a definite plus. You can’t get all cozy and put the awnings and lawn chairs out, but they will do in a pinch when you just need to get something to eat or some shut-eye. In Bend we stayed in the Coachmaster parking lot. They have it set up for their customers to stay there, and are used to people sleeping in the yard. The only issue we had was on the day all the work was finished and we were scheduled to leave, George (our cat) got out. So we spent several more days hanging around waiting for him to come back. I think he got lost or turned around and didn’t know where we were. Both he and we were very happy when he finally made it home. We left Bend on Labor Day. Copyright © 2015-2016 Marie Gale / Jere Matlock. All Rights Reserved.